updated: The Top Ten Best Artists In Nigeria 2015, Nominees Out, Open And Vote Your Best Musician In Nigeria For Year 2015. Hello readers, its November! 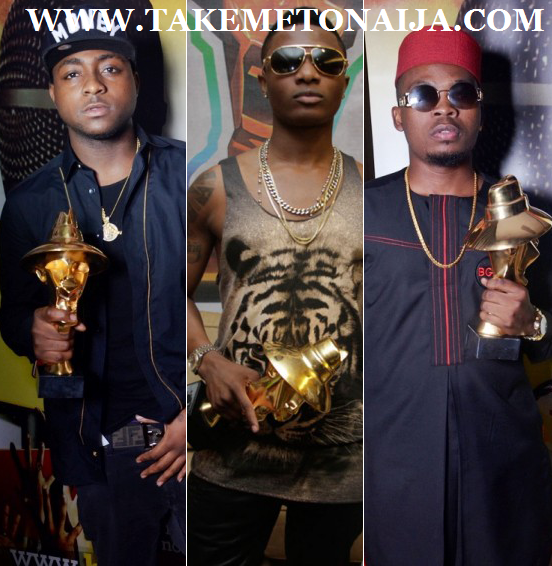 Meaning it is time we rate out the top ten artists in Nigeria for the year. We are at T.I.N Magazine camp have nominated 16 artists whose performance this year have been fabulous and by performance we mean; hit songs, concerts, shows, how much songs they were featured in and more…, but out of the 16 we’ve nominated we only need to list out ten, so we would need the public’s view on this matter. Firstly, you should know the artists on the list are the ones who made real hit songs in year 2015, the performance is only based on year 2015 and 2015 alone. So here you are going to tell us the artists you think rock your world this year, in the poll you are gonna be allowed to vote for as much as 8 artists you think they did really well this year. The most voted for artist is going to be artist of the Year. So take your time and checkout the nominees below. SCROLL DOWN BELOW TO DROP YOUR VOTES! 1] DAVIDO – The popular OBO released so many singles this year a lot which were hits, actually all his songs this year were real hits no doubts about it, when it comes to shows he really did great this year. Actually he was the most nominated artist here in T.I.N camp. 2] OLAMIDE – The guy has been named artists of the year by so many media platforms at the moment, set a record at headies by grabbing 8 nominations this year. The songs he made this year were all crazy! This guy has been showing he really his a king in the Nigeria music industry, common guys, we all know his consistency is just crazy! 3] WIZKID – The guy has been mentioned by many people as the wizard of the music industry as he never fails to be on top of the list of the best artists of the year since he started his career. His performance this year has been great. 4] KCEE – This dude actually made a few hit this year, he was also featured in so many hit songs, when it come to shows; Kcee really did a lot of international tours and was invited to so many shows.. Him and his 5star music gang actually rocked the entertainment scene. 5] LIL KESH – This guy was the 5th most nominated artist on the list, the Shoki dance crooner really made a lot of waves in 2015, he has been nominated as a next rated artist at the Headies 2015. When it comes to collabos he made a lot of hits this year. 6] KISS DANIEL – The Woju crooner has been a real talk of the town this year, with the release of two good big hits the guy really grabbed a lot of fans this year. His two songs have been rated to be among the top ten songs of 2015 by some media sites. 7] REEKADO BANKS – This guy has shown to many this year he his a music genius take it or leave it he’s arguably the best artist in the Mavins camp following his performance this year he deserves a “gbosa”! 8] YEMI ALADE – Well, we actually don’t know what this young lady has done to gain a lot of fans across the nation but truth be told she’s loved by many. The Igbo-Yoruba girl kinda rock the entertainment scene this year, she’s been said by many to be the female artist of the year. 10] IYANYA – He can also be said to be one of the most consistent artists in Naija, he releases hits every year even though they may not be that much but he makes hits. Did collabos and a lot of shows this year too. 11] HARRYSONG – So the songwriter turned singer actually made few hits this year one of his songs is surely among the top ten songs of the year. He’s also been featured in few hits and has shown Nigerians he is a performing artists too. 12] WANDE COAL – Presently, in this month of November this guy can be said to be the most controversial artist of the moment after releasing his sophomore album which has been making news here and there, not to mention he released a few hit singles this year too. 13] PATORANKING – The headies next rated winner actually did his best this year with a few hits and collabos, one of his songs “My Woman” can be said to be one of the top songs of the year. 14] D’BANJ – Just when people were saying he is gone the Kokomaster has shown he is still here by dropping an album this year which had a few hit songs. Not to mention His international performances. Bangalee actually rocked the year no arguments. 15] SKALES – He was earlier missed in the nomination but he finally made it days after. This guy is one of the hottest hit makers of the year with at least 3 good hit songs. That is quiet great. He dropped his debut album this year too. 16] BURNA BOY – He also was missed in the nomination earlier too, but he finally made it, this artiste has shown us he is good at what he does, he keeps up with his not very common pattern of singing and still make hits, he has at least up-to 3 hit singles this year. HOW TO VOTE: JUST SELECT THE 8 ARTISTS YOU LIKE BELOW AND CLICK ON THE VOTE BUTTON UNDER. VOTE THE TEN BEST ARTISTS OF THE YEAR! The poll runs till the end of this month. So share with your friends to vote their favourite artists. Watch out for T.I.N Magazine’s top 20 songs of the year!